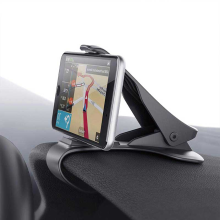 This phone mount can fix itself stably by clipping the edge on the board then fasten the phone in front of the driver without blocking of sight. Suitable for 3-6.5inch mobile phone, tablets, MP4 and other devices. Adjustable 360 degrees display angle, to fit diffent viewing angle needs. With non-slip silica gel does not scratch car and phone. HUD design does not obscure driver&apos;s view, easy to operate, safer driving. One-handed operation, locking and release mounting with only one hand. Fixed and stable curved base design fasten to most car dashboard and other bases. Simple and convenient to install, no any other tool is needed. Suitable for 3-6.5inch mobile phone, tablets, MP4 and other devices.